Moving Averages is probably the first indicator that any learner of technical analysis starts with. Simple and elegant, these indicators are far more powerful than the look of it. In this webinar we will discuss why and how to use one or multiple moving averages. Not only this, we will extend this learning to understand derivatives of moving averages and the powerful signals that they generate. Abhijit likes to define himself with 3is – investor, instructor and influencer. With over 13 years of experience in the Indian Financial markets, he has played pivotal roles in institutions like ICICI Securities and BRICS Securities, Mumbai. Currently he is a SEBI Registered Research Analyst and offers unparalleled services to his client. He believes in context to be more important that content which reflects in his offerings like alphaBETS, 10XTrader & WealthBees. He has been an active trainer in the subject of technical analysis and trading and visits various business schools and institutions like NSE Academy, NIBM Pune, BIBS Kolkata, India Infoline, Kredent Academy & elearnmarkets. 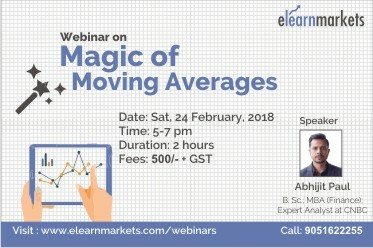 He personally conducts offline and online programs like 10XBootCamp and Qualified Market Trader (QMT), which are both unique path-breaking workshops in designing and implementing different types of trading strategies. Session is really good and useful. Faculty answered all the questions very effectively, highly useful. Excellent webinar. Please do conduct more on various topics. I was not able to attend the entire session because of power interuption. I hope I will get a link to view the webinar again at my own pace. Please share the recording. It is worth for my library. Got enormous knowledge in affordable price. Thank u Mr. Abhijit Paul for this wonderful session. Hope get these type of session in future also. Great webinar lucid and the same time greatly insightful and practical. Keep me posted on RSI webinar if in future by Abhijit Sir.